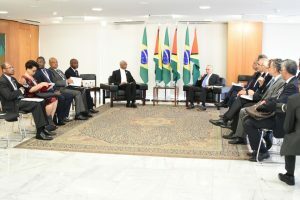 Guyana and Brazil on Thursday inked two agreements aimed at forging ahead with plans to construct a road link between the two countries and combating drought in the Rupununi region. The agreements were inked during President David Granger’s official State-visit to neighbouring country where he met his Brazilian counterpart, President Michel Temer. The agreement on infrastructure is one in which the two countries committed to enhancing the infrastructure between in the interest of economic and social integration. The construction of the long-awaited Linden-Lethem road is one of the key projects under this agreement. President David Granger said that for decades both sides envisaged a route through Guyana, which will provide better development prospects for investors to come from the Caribbean into Brazil and from Brazil into the Caribbean. “This is something that has been long discussed and in fact, in some parts of the Rupununi, roads were actually aligned but we never had funding to complete it. The infrastructure agreement we are entering will be focused on fulfilling that obligation to building a road between Lethem and Linden. Brazil has done its part; Brazil has built a bridge under President Luiz DaSilva and the road literally comes right out to the bridge. We need to do our part so that is a very important agreement that was signed,” he said. Minister of Foreign Affairs, Mr. Carl Greenidge explained that in July, earlier this year, he and Minister of Public Infrastructure, Mr. David Patterson met with their respective counterparts to discuss moving the project forward. At that forum, it was agreed that both countries will provide financial resources for the engineering and design of the road. “The engineer and design probably would cost somewhere in the region of $5M to $10M, between the two countries and with another partner, probably one of the multilaterals, we will close that financial package for that design… Guyana has been speaking about it for ages; the funding of the road clearly is a challenge to both countries. Guyana is very small so this is a big burden in terms of the financing costs. In order to conclude financing of such a project you have to have all the technical aspects completed. The engineering design is one of the last aspects of the technical side to be completed,” the Minister disclosed. He also informed that the two countries will be working closely with the People’s Republic of China to how to access the $50B China Select Fund can be accessed to complete the road. Minister Greenidge explained that this road link is a critical piece of infrastructure that holds great potential in terms of integrating the two countries and improving trade. “The region of Roraima will not only provide Guyana with markets into Brazil and into Roraima, but in terms of volume, a larger volume of movement will be involved so as to get Brazil’s products, agriculture or otherwise, into the international markets by the route that turns out to be a lot cheaper than the route that they currently use so it is a value to both sides,” he said. Guyana and Brazil have enjoyed cordial relations since the establishment of formal diplomatic ties in 1968. The country has received Brazil’s support on the ongoing Guyana-Venezuela border controversy. In fact, the President described Brazil as “a guarantor of Guyana’s territorial integrity”. “Brazil has borders with every country on the continent of South America except two and Brazil has stated over and over again that it has no interest in redrawing borders… Brazil has stated over and over again its principle that borders which have been established under international law should not be disturbed and that is all we ask for,” the Head of State said. Brazil and Guyana have a lot of of shared interests and noted personal ties, which go beyond institutional relations. At present, Brazil is working to rectify existing laws and addressing other domestic procedures to advance the air services agreement to facilitate easy transportation of passengers and cargo. Thursday morning, President Granger, along with his delegation which includes Minister Carl Greenidge, Minister of Natural Resources, Raphael Trotman and Minister of Public Infrastructure, Mr. David Patterson, met with President Michel Temer of Brazil at the Planalto Palace in Brasilia.